Nairobi (Agenzia Fides) - A Kenyan priest was killed: Fr. Evans Juma Oduor, who was found unconscious on Sunday evening, October 22 near a sugar cane plant near Chiga Market Center in Muhoroni, 30 km from the Convent of Nyabondo. The burned carcass of his car was five kilometers away from where the priest was found. Brought to the hospital, Fr. Evans, who had head injuries, died a few hours later without regaining conscious. Fr. 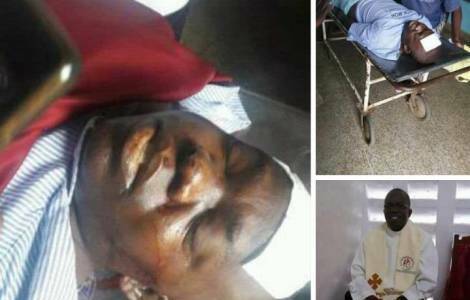 Evans was parish priest at the church of Sigomore, part of the Archdiocese of Kisumu, in the West of Kenya. According to the local press, two weeks ago, Fr. Evans had launched a public appeal to the government to stop killing the Luo, Raila Odinga’s ethnic group, the leading opponent of outgoing President Uhuru Kenyatta in the August 8th presidential election, then nullified by the Supreme Court, on the appeal of Odinga himself . Tension in Kenya is very high on the eve of the repetition of the presidential vote to be held on 26 October and boycotted by Odinga (see Fides 11/10/2017) as a protest for failing to accept his request for a review of the composition of the Independent Electoral Commission (IEBC), at the center of a political controversy. On the other hand, the Supreme Court had justified the decision to annul the vote of 8 August because the Electoral Commission "ignored or refused to conduct the presidential elections in a coherent manner with the dictates of the Constitution" (see Fides 1/9/2017).